Hold up they are amazing why do they need a resprite. when you dont realize that you can edit your post so you double post. Dr. Mario, Mario and Luigi are definitely some of the best looking characters in the game. Yeah they have good sprites. Hey, am I the only one that thinks Zero Suit Samus and Marth could use a resprite? I wish I don't have to look at Marth's broken teeth and sausage mouth again one day. I actually think both Power Suit Samus and Zero Suit Samus need a resprite, maybe Fox and Falco, but i haven't seen those much so pretty much ignore that, and i think Toon Link should have a little more movement, but my main focus is PSS, she REALLY needs an improvement. Really, the better question is who doesn't need a resprite. I'm seeing surprisingly little Yoshi in this thread. I'm tempted to say Ristar but really the main thing I don't like about his current sprite is his facial expression. Everything else about them is fine. Now that you mention him, Ristar does need some resprites too, i don't think Yoshi is that bad, but i think Ristar's sprites are very underwhelming, i dunno, i expected better, could have used his original sprites with some editing i guess, but Ristar needs a revamp, actually not only in sprites, but in his moveset too, i just feel it a little uninspired. Samus, in my opinion is one of them. Her legs are a bit too thick and her shoulderpads are a bit... tiny. Very tiny. Perhaps even Ridley if you manage to make him a little less stiff. And Bowser's awkward transitions between Melee-traced sprites and sprites from main Mario games. I say that DK, Zero Suit Samus, Fox, Falco, Krystal, Bomberman, and Duck Hunt Dog need to be completely reworked from the ground up. Everyone else that needs some more work done to improve the quality of their animations. Some have a lot of stiff and awkward movements, while others could use just a few touch-ups. 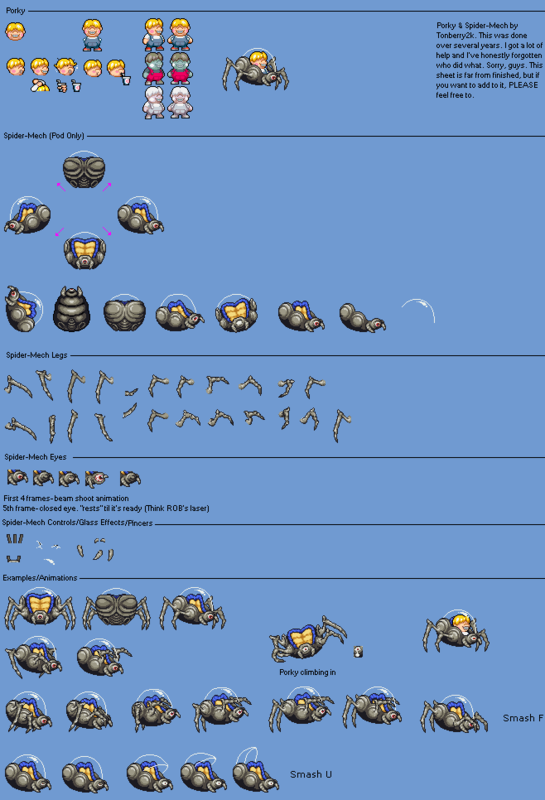 at least based on that incomplete sprite sheet, by Tonberry2k, of his Heavy Armor in Mother 2.
it got a lot of stuff ready to be piece together too (ala Gen5 Pokemon sprite animations) so take advantage of that please!